If your content marketing doesn’t drive leads and ultimately sales, it’s a #FAIL. Understand that if your audience doesn’t purchase from your company, your content marketing does NOT achieve your business objectives. Even worse, your content could be helping convert your competitors’ prospects. 67% of content marketers with no strategy are challenged to measure their content marketing results. 38% of marketers who document their strategy are challenged to measure their content marketing results. Documented content strategy generally translates to measuring content marketing performance back to your business objectives. Without planning for content marketing success, there’s a break down between your content and your sales. 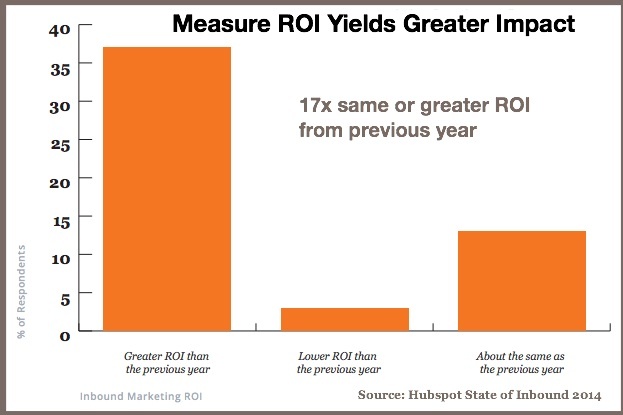 Hubspot’s Inbound Marketing Research found that focusing on measuring ROI, improved ROI 17 times. 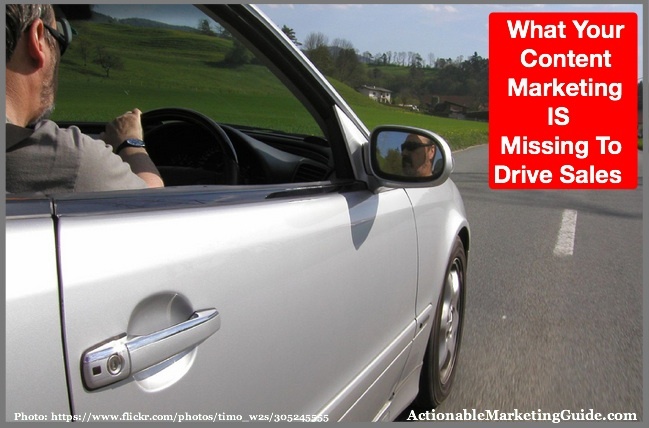 So what is your content marketing missing to drive sales? The answer: At least one call-to-action. It’s so simple that many marketers overlook it because it’s often one of the last steps in the content creation and editing process. Marcus Sheridan does a good job on this squeeze page intended to weed out non-buyers. 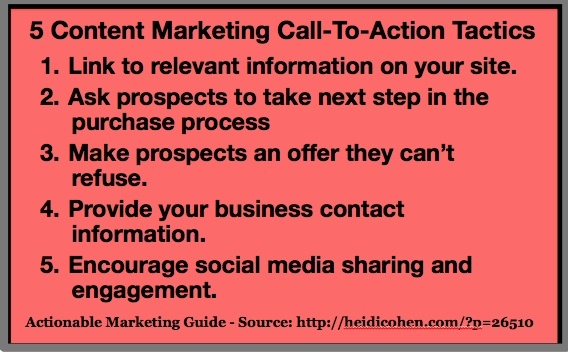 To incorporate a call-to-action in every piece of content, here are 5 content marketing call-to-action tactics. 1. Link to relevant information on your website. This is my favorite call-to-action because it’s NOT promotional. It helps prospects that are actively seeking purchase related content when they’re in purchase research mode. Ideally the link should go as deep as possible into your product offering. The goal is to reduce steps to purchase. Remember: The more pages and steps your reader must click-through, the greater the likelihood of losing your prospect. Incorporate links to the 5 basic content marketing types: product information, customer FAQs, how-to’s, styling and customer ratings and reviews. Optimize the pages to which you link for mobile friendliness. Bear in mind that people do purchase research on-the-go, in short spurts of time. 2. Ask prospects to take the next step in the purchase process. Don’t assume your content marketing audience is ready to purchase from you after consuming your content. Marketing and sales require romancing your potential customer. That doesn’t mean that you can’t ask your readers to do something. If you don’t ask them, chances are that they’ll move onto the next piece of shiny content, which is probably not yours. Give readers the option to do something that requires a low commitment, such as an email signup or following you on social media. This is particularly important for B2B buyers who tend to make big purchases and require lots of input. Offer readers more than one call-to-action option. Don’t make your call-to-action all or nothing, especially if it means purchase now or goodbye. Limit the number of choices. Give your prospects too many choices and they do nothing. They can’t make up their minds and leave it for later, which never happens. This can be a good area to test to determine what is optimal for your target market. 3. Make prospects an offer they can’t refuse. Every one loves a deal. It’s the reason my father’s grocery shopping trips always included whatever was on sale, even if my mother never used the stuff. Many people need a price incentive to follow you or join you on social media. Make price savings offers time limited. Don’t train your audience to wait for sales or they’ll only buy at discount. Do the math. Ensure that you at cover your costs. Ideally, you should perform a lifetime value analysis to determine how much you can spend to acquire a lead and a customer. 4. Provide your business contact information. This is a subtle call-to-action because it facilitates interaction if your prospect wants immediate help or purchase. Depending on your content and where it’s distributed, include your phone number, email and physical address. Other options: include social media if you have customer service available to help prospects, and fax numbers where this applies to your business. Your goal is to get people further into the buying process. Let them order however they want!!! Make your contact information accessible via a mobile device. Your buyers maybe looking for you when they’re on the road. Where appropriate, include a link to maps. Be prepared to close the deal. If someone is calling you, make sure that they can order your product via the person who answers the phone. Don’t loose potential sales because you’re not prepared. 5. 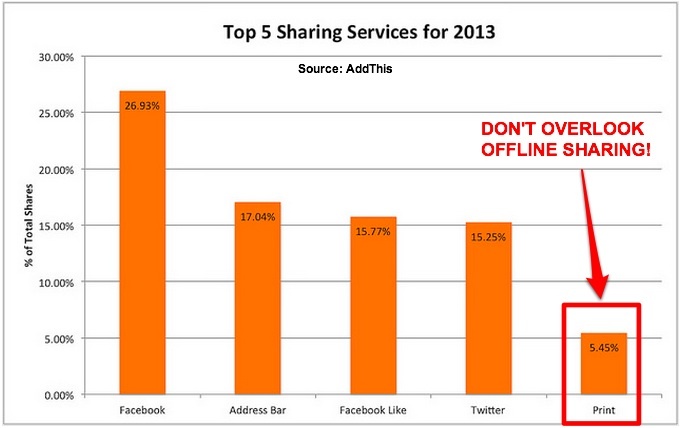 Encourage social media sharing and engagement. Place your social media icons at the top and bottom of your content marketing. 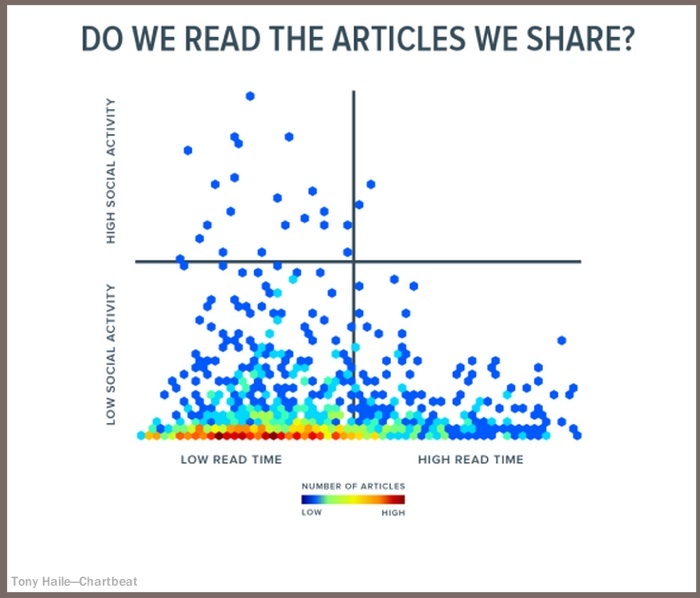 Alternatively use a sliding vertical social sharing so that readers can act when they’ve read enough content. It may not be the entire article. These 5 content marketing call-to-action tactics will make your content marketing more measurable and will yield greater sales because you’ll be able to track which content is converting readers into prospects and buyers. Take these tips into consideration as you audit older content to ensure that it has calls-to-action and that they link to current pages of your product offering. 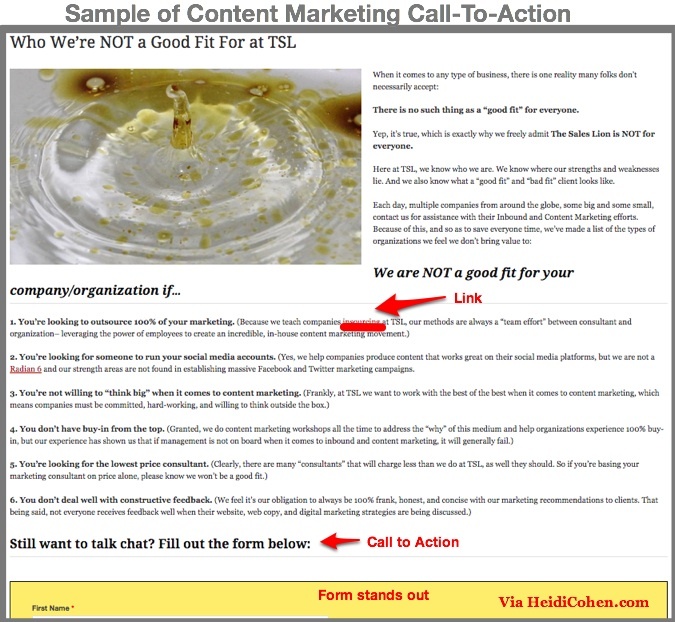 What is your favorite content marketing call-to-action? What has your success been using them? Tags AddThis, Call-to-action, Chart, Chartbeat, Hubspot, Marcus Sheridan. Bookmark the permalink.